In line with this year's Gallery Weekend Berlin, Galerie Barbara Weiss is presenting its fifth solo exhibition with the artist Ayse Erkmen, who is based in Istanbul and Berlin. The focus of her show titled Wesenszug is a yellow and white sculpture made of acrylic; it is a remake of the artist's first exploration of using acrylic as a media which won her the 1st prize in her very first semester show at the University of Mimar Sinan (Sculpture department), Istanbul in 1969. In addition, the artist will place 10 pairs of yellow and white acrylic sheets tied together onto the gallery floor. Yet, this simple stack of material will only be transformed into 'surprise sculptures' once it has been purchased. On the gallery walls, ten, carefully coloured wall sculptures will be mounted spaciously around the exhibition space. These radiant and multifaceted colours as well as their congruent shapes correspond to the Pantone Fashion Colour Report of fall 2013, a 'global authority' on textile colours. Like in earlier shows, the artist appropriates and examines existing forms and use of materials in architecture and design hinting at eminent questions of the value of the useless ahead of the useful, and simultaneously gives an insight into the Wesenszug (essence) of things; the different perspectives of how they could be used, and how they are made. 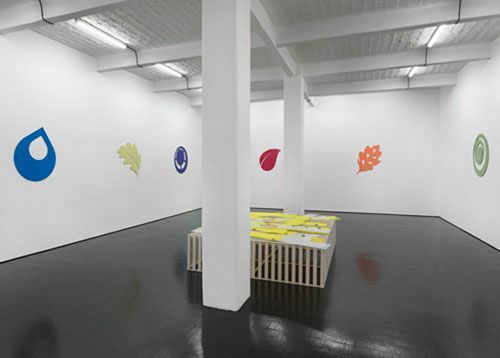 Ayse Erkmen has had many important solo exhibitions in renowned institutions (including Witte de With ' Center for Contemporary Art, Rotterdam (2010); Hamburger Bahnhof ' Museum für Gegenwart, Berlin (2008); Sculpture Center, New York (2005); Magasin 3, Stockholm Konsthall (2003); Kunstmuseum St. Gallen (2003); Secession, Wien (2002). In 2011, she represented the Turkish Pavilion at the 54th Venice Biennial.